Sailing a small boat in the Greek islands brought many lovely encounters, including the hospitality of the Greeks. People were often ready to share what they had, however poor they were in those years of rebuilding Greece from the devastation of World War II. Their kindness ensured we could sleep easy, after even the most traumatic experiences. Robin, my future husband, had been a steadfast friend in danger. His singing in the storm had created a special bond and it was 60 years ago today that another huge and wonderful change come in my life. “The Levkas channel opened out, but it was still relatively sheltered. 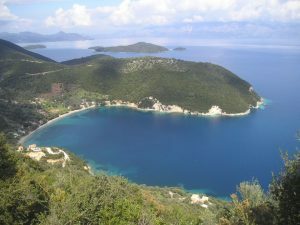 We were determined to reach Roudha Bay on the southern tip of Levkas before night, a good stepping-off point for Port Polis on Ithaca. But two miles short of it we found ourselves becalmed. So much for the three-day storm! We rowed back to a deserted bay called Dhessime we had passed earlier. Not a house in sight. One of the most beautiful anchorages I have known. “We dropped the anchor over the stern, and let the boat drift towards the shore. We would take a line ashore and wrap it round a boulder, so that we could land and have a walk, and then pull in on the anchor rope so as to be further away from the shore for the night. “Stepping ashore, we found ourselves quietly greeted by a family of Greek peasants who were already there. We apologised for intruding. They protested they were glad to welcome us; it was seldom they saw anyone. They offered us a drink of cool water, by way of hospitality, and delicious home-dried raisins, showing us a few vines which they had planted nearby, and their orchard. They said their winter house was near to the kapheneion, at the head of the bay, but they also owned this small patch of land on the water’s edge. “For their summer home they had made themselves a platform in a tree on the water’s edge. A cheese in muslin hung from one corner of this platform, so they must have goats. And a fishing-boat was moored a little way away, along the shore. There was a well, and they invited us tomorrow to take as much water as we liked, and wash the salt out of our hair and clothes. “We sat in the cool of the evening talking with them for some time. The fisherman did not tell us we ought to have a bigger, faster boat, as the Italians always did. Instead he told us how during the German occupation, in a boat no larger than ours, and moving only during the hours of darkness, he used to travel regularly to Methone on the southern tip of the Peloponnese and to villages on Corfu, in search of provisions. “We shook hands and said goodnight, and the roughness of the mother’s palms took me by surprise. Clearly their life was incredibly hard, compared with anything I had experienced, and yet as a family they seemed utterly content, rooted in their own place. When I thanked them the mother said it had been a pleasure to make us welcome, ‘Zeus protects the stranger’ she said, by way of explanation. The first time I had heard those words. “We cleaned our teeth, changed into warm clothes for the night, and stretched out on the benches to sleep, relaxing into the welcome of the smooth horizontal surface, hard though it was. I was deeply moved by the evening’s encounter. These people seemed to be giants of endurance, of skills and strength. When I later looked at the photos taken by Robin I realised how, like Gulliver, Sally and I towered over them. “I thought over the day, and the kindness of the people in the little kapheneion near Santa Maura fortress, where we had staggered in exhausted, after we had so nearly drowned ourselves. And I realised also that from now on things were different between me and Robin. The sound of his quiet singing of Irish folk-songs, close by, had seen me through what had been the scariest hours of my life. If you want to buy my memoir of 3 summers of sailing from Malta to the Bosphorus, click here.